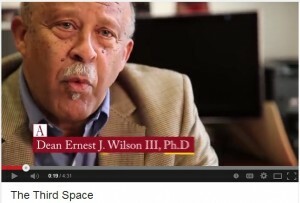 USC’s Third Space webpage is up and running, complete with an exciting video overview. The Third Space is defined as the unique set of attitudes, perspectives, experience and knowledge that have been determined to be crucial to being successful in the 21st century in practically any industry, and in the MCE (media, communication and entertainment) arena especially. USC Annenberg is the pioneer in recognizing, defining, mining and providing these capabilities in its students and to its constituents. Take a moment to see what we’re talking about by visiting the page or viewing the video directly.